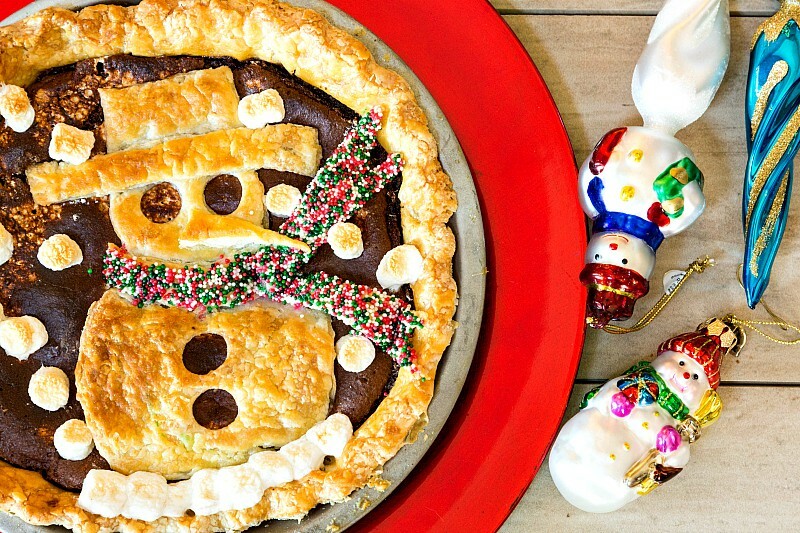 Mexican Hot Chocolate Pie with Snowman Crust Applique: So Cute! Inspired by my friend Renee’s absolutely adorable turkey crust pumpkin pie, I decided to get crafty with my crust treatment and came up with this Mexican Hot Chocolate Pie with Snowman Crust Applique. The pie is delicious, and you can use the same techniques Renee and I used to come up with your own cute crust applique ideas! Not convinced? Take a look at him from overhead. I think he’s pretty cute! First, let’s talk about this pie. 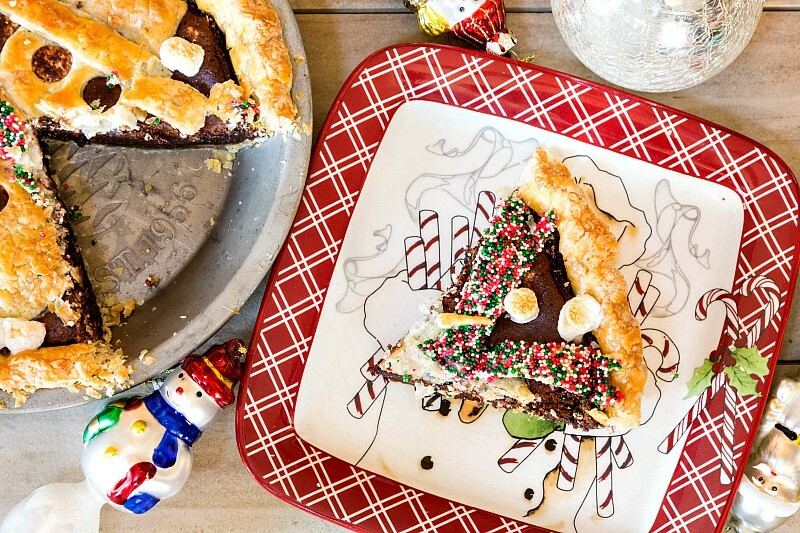 It’s based on a chocolate chess pie. As a matter of fact, the base recipe is identical to the Old-Fashioned Chocolate Chess Pie I posted almost a year ago. The only changes I made were to add a layer of marshmallow cream to the bottom of the crust before adding the batter and to add a touch of cinnamon and chipotle powder to the batter itself. The marshmallow cream ups the gooey factor, and the spices add some depth and complexity. 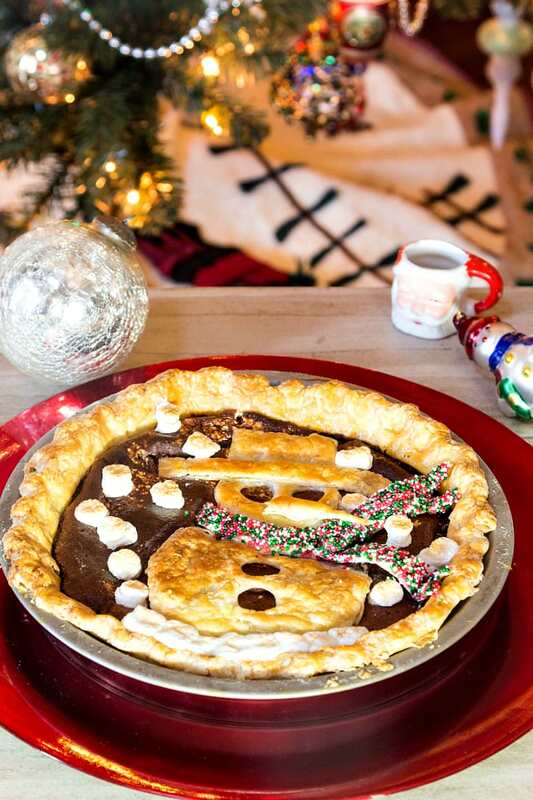 Seriously a winner, even without the snowman crust applique. Which is super cute, though, right? I am not nearly as good at taking process shots as Renee is, so for an in-depth look at the process, please do read her post and check out all the photos of her adorable turkey crust pie. What I can do is tell you the Rules I followed to make the applique come out crisp and clean, so let’s get to it. Roll the dough for the appliques much thinner than you would for regular pie crust. They will be baking only half as long, and you want them to crisp up all the way through, so roll them about half as thick as “normal” pie crust–about 1/16″. To glue the pieces together, just use water. To completely coat a piece in sprinkles like I did for the scarf (which was three pieces I glued together after dipping), brush on a thin coat of egg wash and then dip that side into a plateful of your desired sprinkles. Press gently to encourage the sprinkles to adhere. I assembled the main parts: body, head, piece of scarf that goes around the neck, hat, and brim first before placing it on the pie. You don’t need to glue the applique down to the pie itself. You only need to glue the pieces together (again, with water). I placed the tails of the scarf once I had the snowman where I wanted him. You can keep the assembled guy in the fridge until you’re ready to place it on the pie. I totally forgot to put his nose on until there were only 8 minutes left of baking time. But nothing bad happened. Brush the whole applique (except ones you covered with sprinkles) with a thin coat of egg wash before placing back in the oven. I used graduated cutters to cut out the rounds for the snowman. I used the base of a piping tip to cut out the eyes and buttons. I free-handed the nose, scarf, hat, and brim just using a knife. I baked the pie for 25 minutes before adding the applique pieces. Then I baked an additional 22 minutes (your time might vary) until the filling was well puffed and firm on top. The marshmallow cream sort of bubbled up through the filling in a few places and gave a feeling of snow. I added the marshmallows after baking, let them melt into the pie for a couple of minutes, and then finished them under the broiler for 1 minute. If you don’t want big honking marshmallow snowflakes, you could use these instead. Bake the pie on a preheated baking stone to ensure the bottom crust bakes up nice and crisp, even without blind baking. To Cut the Finished Pie: To get the cleanest possible slices, start each cut with the tip of a sharp knife and just cut down all along the slice you’re cutting–no sawing motion. When you have cut through all the top crust cleanly, you can go back and drag your knife through continuously to make sure the slice is free before serving. I was a little concerned it would be a pain to slice, and while I did have to take more-than-usual care, the process was easier than I’d anticipated, and the cut slices look really good. Try not to cut through the marshmallows, though. They get stuck on the blade and muck up the works. 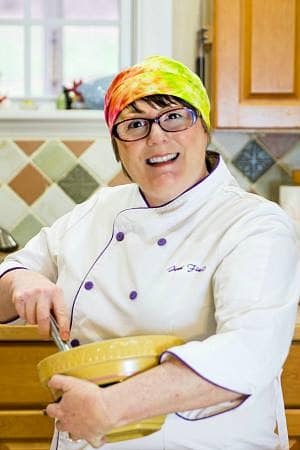 Now you know the ins and outs, let’s get on with the recipe, shall we?